A friend of my from the website Walyou, Tal Siach suggested me to visit this website. Bust A Name is a very interesting website where you can do 2 very important thing in one time when you are searching a name for your company. First you can enter words that have somethings to do with your company and words you would like to come back in the name of your company, then you could click on the words to get suggestion of closely related words to add more. 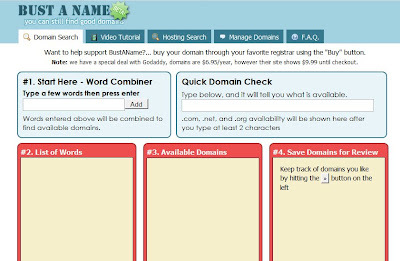 then this website automaticly search for available domain and also matches the words between each other to get a unique combination. However still you need to see it for your self if the name is good or not. However the search if the domain is available is very important so it is made easier for costumers to go to your website with the same name. Wouldn't be nice if they had to go to a website with a name that is not remotely close because you couldn't buy the domain. So this is a handy tool to find yourself a name for you company however, you still need to see if the result that comes out is good or not. First should be easy to say and to remember and also good meaning in it. In my guides area there are more guides about starting a company or searching for company names and more. Got to how to design a brand name guide here.